VAULT unveiled its latest timepiece – the V1-X – at this year’s Watchmakers Club Event in London, November 7th 2018. 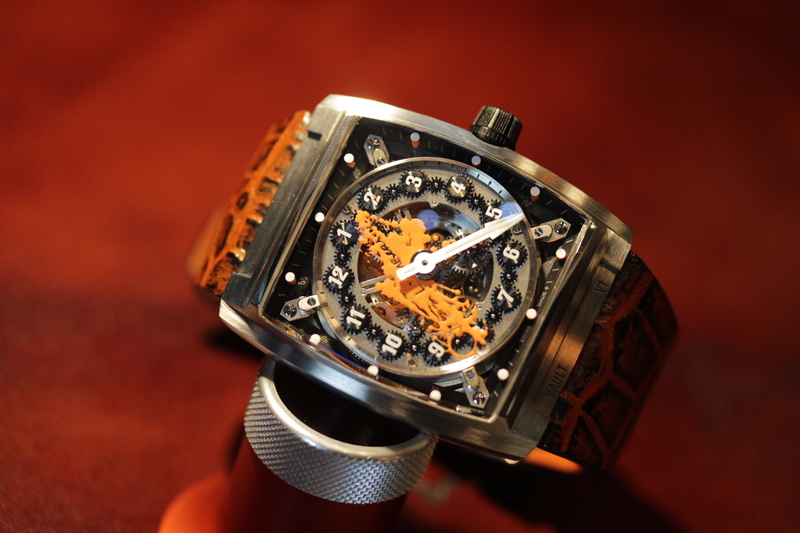 The team around Vault Swiss, driven by Mark Schwarz, is creating the latest VAULT timepiece by unleashing their creativity and kicking off the first of several art pieces under the V1-X label. Above you see the last name of the artist written in the orange splash. The first featured artist is Laurent Auberson who is also the designer of the VAULT V1. The project brief was to mesh abstract minimalist art with cutting-edge mechanics as found in the V1. In case of the V1-X, the team decided to use the sapphire crystal disc, which indicates the hours on a V1, just like an artist uses his canvas and add a pretty unique splash of orange to the crystal. A paint splash has, in fact, a couple of fascinating aspects: first of all, an artist can never fully control the shape and size of the splash – just like we cannot control time – but actually it is formed by the time between the instant of impact and the colour reaching its solid state. “We might not be able to control time but we are able to manage it”, says Mark Schwarz. Especially in our fast-paced lives, we have found ways to bring in some structure to the perceived chaos surrounding us. Symbolically for this structure, Laurent managed to integrate a way to read the hours using cleverly applied negative space in the splash and a pyramid shape creating an easy and exciting way to read time. To make the V1-X stand out at night, RC-Tritec applied orange Super-LumiNova to the sapphire disc, which creates a super cool halo effect around the disc. 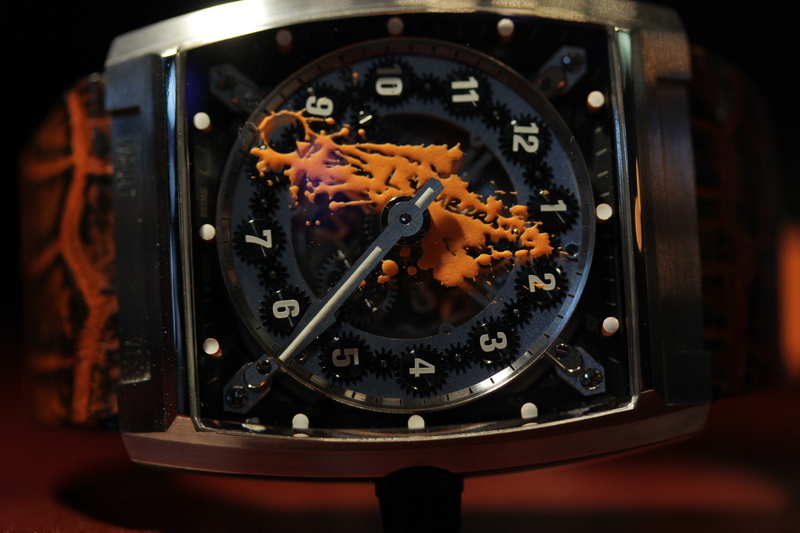 Lumicast 5-minute markers frame the art piece adequately and make the watch pop in the dark. 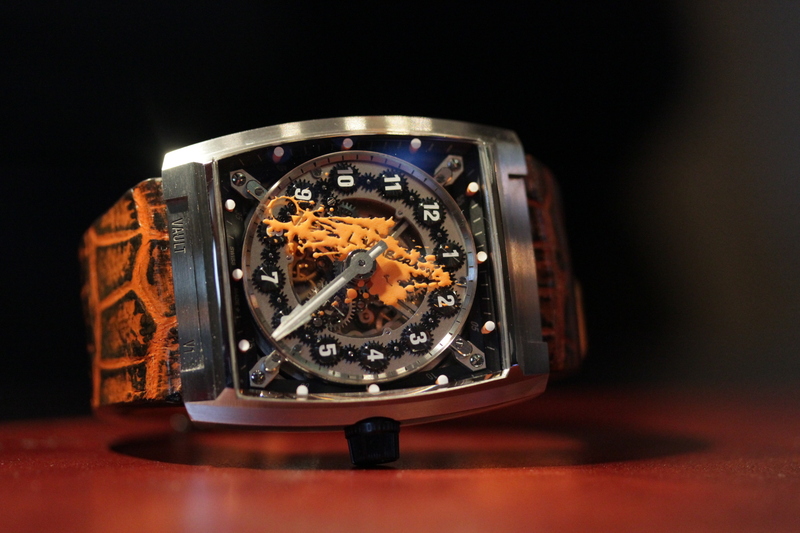 To round off the art piece Mirea Marian, a master strap maker, created a matching crocodile leather strap with hand painted orange accents.